If summarising Novalis’s career in Schmetterlinge was a daunting task, Grobschnitt’s 79:10 has proven to be a herculean one. Not only was Grobschnitt’s career longer and more varied with some arguably better results, but the depths reached by this expansive box set leave no stone unturned. There’s a lot to engage with here, so let’s dive right in. Firstly, what’s in a name? Seventy-nine minutes and ten seconds is, according to the liner notes, the maximum running time for a CD. (Lupo and Eroc have apparently never listened to Transatlantic’s live albums Whirld Tour 2010 or More Never is Enough whose respective versions of The Whirlwind stretch to 79:52 and 79:46. Good for them.) Seventy-nine minutes and ten seconds is also the duration of each of the 17 discs that comprise this box set, an astonishing aesthetic effort on the part of the band members who compiled this set. While this sometimes involves sneakily adding a bit of spoken word (in German) about the history of the album to make up the time, for the most part, these are bona fide bonus tracks that don’t appear to have been cropped to meet the ’79:10′ rule. Unfortunately, it’s quite difficult to assess the rule without a stopwatch; iTunes doesn’t agree, but only by a few seconds on each CD and it tends to give unreliable numbers anyway. Nevertheless, the dedication to such a decoration proves how serious the group are about presenting their music as never before. The box isn’t without its flaws, however. As with Schmetterlinge, the album art has not been deemed important enough to be represented in full. Instead, merely the front cover adorns each of the 14 gatefold cardboard slipcases, opting for a more consistent approach with the album info on each sleeve. Even the gargantuan 96-page booklet replete with band photos, posters and ticket stubs fails to reproduce any art. The only consolation prize is the art print of the Rockpommel’s Land inner gatefold signed by the band’s founding members, which is a truly wonderful personal touch. The box set sets off with the self-titled Grobschnitt, released in 1972. With two extended pieces, it’s a wonderfully rough-around-the-edges start to the band’s exciting career, full of fantastic ideas, but not quite refined into the exquisite pieces that would come later. Symphony with its chanted opening is the ideal introduction to the band’s comedic style while Sun Trip is a powerful showcase of the new band’s talent. Ballermann sees the band condensing these ideas into shorter, punchier tracks while retaining a love affair with the long form. At 13½ minutes, Magic Train is a delight to all progressive fans: a beautiful extended piano intro, solid lyrics and instrumentals and a climactic finale. This album also features the earliest incarnation of the divisive Solar Music, a 33½ minute experiment that the band would work on for the rest of their career, with half a dozen live versions featured in this box set. Incredibly, the band’s third album, Jumbo, is only a minute longer than Solar Music, featuring just four proper tracks. By this point, the band had tightened up and every song displayed very precise arrangements with skilful musicianship. Once again, the longer pieces hold the most value; The Excursion of Father Smith is an expertly arranged symphonic track and foreshadows some of the brilliance to come soon while Sunny Sunday’s Sunset features more atmospheric sections tied together with fast-paced instrumentals. The German version, titled Jumbo D, is also included in this box set but features no differences except in the lyrics. Rockpommel’s Land is a striking album, both visibly and musically. The Roger Dean-esque artwork gives a sense that the band are either trying to ape Yes or parody them. In fact, it’s a bit of both. 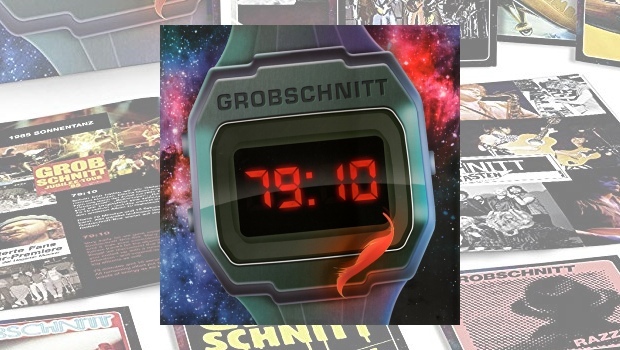 This ambitious concept album featuring four tracks, one over twenty minutes, is Grobschnitt’s satirical love letter to all prog concept albums, skewering the genre whilst embracing it warmly. The band took painstaking effort to make this album as tight and intricate as possible, tweaking it to perfection, rather like Yes did with Close to the Edge. Even the way the outro to one piece gives way to the intro to the next is balanced flawlessly. The result is a masterpiece, an endlessly satisfying concept album that can be played over and over. The bonus live version of the album is an absolute treat from start to finish, showing how in sync the band were as a live unit. By this point, Solar Music had taken on a life of its own in concert, sometimes stretching to over an hour in length. The band decided to chronicle this in the highly-acclaimed Solar Music Live which, when played back to back with Rockpommel’s Land, does sound like a different band altogether. At 53 minutes, the full improvisational suite is a lot to take in but taking the time to do so is highly rewarding. What’s more, the bonus disc includes a second similar version from the archives so you can pick and choose which version you prefer. Also included is a 20-minute snippet titled Heavenly Music of the group’s favourite tape from this period which features phenomenal drumming throughout over the outro to Solar Music. Unfortunately, by the end of the ’70s, Grobschnitt faced the same ultimatum that every other prog band did at that time: go short or go home. To their credit, the band didn’t sell out immediately. 1979’s Merry-Go-Round featured an average track length of just under seven minutes, well within the prog remit. The band rock hard on this album, but it’s difficult not to yearn for the intricacies of yesteryear. 1980’s Volle Molle encapsulates the live experience, although it’s a little difficult to appreciate without knowing German or, crucially, being able to see the band’s comedic antics visually. The four minutes and eight seconds of the spoken word Coke-Train-Show are rather cumbersome to sit through. This is nevertheless made up for by the 16-minute Rockpommel’s Land medley and the remarkably different half-hour Solar Music Power Play. Illegal is where things begin to get difficult. We’re now in the 80s, and the effects show. Most of the songs on this album are short, the exceptions being the adventurous Mary Green and the sound-effect driven title track. Opener The Sniffer gives the listener hope of a more progressive affair, but the rest of the tracks prove otherwise. The melancholic instrumental Silent Movie is the only other saving point of this album. Razzia, Eroc’s final album with the group, is completely unlistenable by comparison. On Jumbo and Rockpommel’s Land, melody had been paramount on every track. Here, melodies are eschewed for cold, synthesised rhythms, harsh vocals (now sung exclusively in German) and alienating effects. Maybe Grobschnitt felt like they needed to get away from themselves, but it was an experiment that did not succeed. Many times I have tried to sit through this album and I’ve simply never been able to do it. Even the lighter and warmer Poona Express fails to hit the spot in the way Grobschnitt songs used to. The concept album Kinder + Narren shows the band being swept away by the ’80s, with almost all prog sensibilities being replaced by pop elements. If you decide to play this album in full, you’re in for 45 minutes of pedestrian, plodding synthesised music. Without having the German to be able to understand the lyrics, this is a very dull album indeed. This decline is very similar to stablemates Novalis, although Novalis were able to create far more catchy songs in their latter period. Sonnentanz is a much-needed breath of fresh air, an ’80s update to the classic Solar Music. While a few themes remain from the original, this 36-minute suite is a completely different kettle of fish to what came before, now featuring singing in a few sections. The guitar is just as soulful as ever, and the addition of saxophone is tasteful and effective. You can just skip Go For Love and Geradeaus on the end. An additional version of Sonnentanz is included to make up the 79:10 on this version, and it’s certainly interesting to compare the two side by side. Then it’s back to the studio with Grobschnitt’s final LP Fantasten. There are some highlights on this disc, especially the rock instrumental Sous Le Tapis and the intro to Komm’ Und Tanz’, but for the most part, this album is comparable to Kinder + Narren with a slight shift towards a harder rock sound. Not the worst note for the band to go out on. Last Party – Live brings the collection to a close featuring music from Grobschnitt’s farewell concert in 1989. With Eroc coming back to the fore, this is an energetic collection of songs, but it’s not really the Grobschnitt we know and love. This could have been an opportunity to present a showcase of the band’s best music from both decades. As it stands, only Anywhere from Rockpommel’s Land is there to represent the ’70s. With no new interesting renditions of older songs, and just a catalogue of ’80s dross to wade through, this won’t be of much interest to prog fans. An explosive rendition of Sonnentanz does keep things interesting in the second half, and this version might be even better than the original. At the end of the day though, it was clear that the band had come to the end of their musical journey and signed off with a bang. While Grobschnitt was a truly exceptional prog band in many ways, it seems the group were destined to follow the path that many other prog bands were led down in the ’80s. 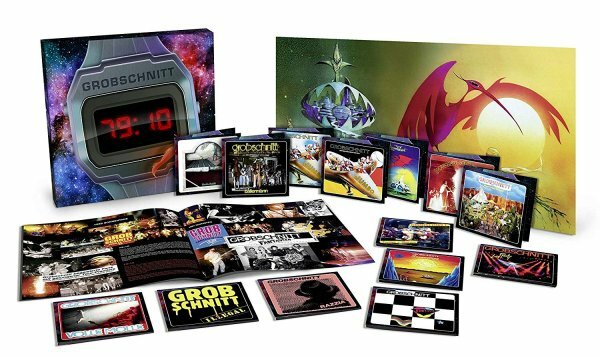 While the latter half of this truly epic box set is a slog not worth investigating, it’s worth reminding ourselves of the brilliance that was early Grobschnitt, from their experimental days in the beginning through to their symphonic phase with the unprecedented genius shown in Rockpommel’s Land. The plethora of bonus tracks makes for fascinating listening between albums, giving an in-depth look at the band’s behind-the-scenes at every point in their career. If you have any love for Grobschnitt already, this will definitely be the box set for you. Wonderful Music indeed!